By Kori ~ June 11th, 2012. Founded in 2007 by brothers Pinto and Billo Naravane, Rasa Vineyards has already become a superstar on the Washington wine scene. Their beautiful winery is located south of downtown Walla Walla near the Washington/Oregon state line. Both Pinto and Billo have engineering and mathematical backgrounds and worked in the computer industry. As for their official titles at the winery, Pinto is the managing partner and Billo is the winemaker, but the brothers collaborate on every aspect of the business. Currently, they produce around 2,000 cases per year. Recently, we had the opportunity to taste three recent releases from Rasa Vineyards in a blind samples tasting, the 2009 Occam’s Razor Syrah, the 2009 Doctrina Perpetua Montaigne Syrah, and the 2009 Living in the Limelight Petit Verdot. The 2009 Occam’s Razor and 2009 Doctrina Perpetua Montaigne are their first single-vineyard Syrahs. Occam’s Razor is from Block 10 of Seven Hills Vineyard and Doctrina Perpetua is from Block 5 of Bacchus Vineyard. Both blocks are planted with the Syrah Phelps clone. All of the Rasa wines have interesting names with stories behind them. Occamâ€™s Razor, named after a 14th century Franciscan friar and logician, basically states that given all the things are equal, the simplest answer is usually the best answer. The Naravane brothers use Occamâ€™s Razor as one of the many guiding principles in their lives. Doctrina Perpetua means â€œforever learningâ€, and this inaugural vintage of Doctrina Perpetua celebrates Michel de Montaigne, who was a philosopher, essayist, skepticist, humanist, and one of the most important writers during the Renaissance. Living in the Limelight features Petit Verdot as the main character, a variety that is typically cast in a supporting role. 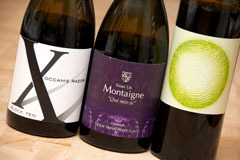 Rasa Vineyards offers their wines through their mailing list first. They are also distributed in a number of states. If you have not had a chance to try one of their wines, I encourage you to keep your eyes out for them on the shelf at your local wine shop or go ahead and put your name on their mailing list. Only open by appointment, Rasa Vineyards is definitely a must-visit if you are in the Walla Walla area. 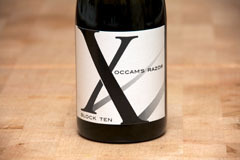 2009 Rasa Vineyards Occam’s Razor Syrah (Block 10, Seven Hills Vineyard, Walla Walla Valley, Oregon): Dark purple. Gorgeous nose with black fruit and floral notes. Blackberry, black cherry, floral notes, black pepper, and beef jerky come through on the palate. Full-bodied with crisp acidity, and high tannins. Well-balanced and smooth with a long, lingering finish. 2009 Rasa Vineyards Doctrina Perpetua Montaigne Syrah (Block 5, Bacchus Vineyard, Columbia Valley, Washington): Dark purple. Very aromatic with black fruit and earth on the nose. Blackberry, black cherry, earth, black pepper, and spice come through on the palate. Full-bodied with crisp acidity, and high, dry tannins. Well-balanced with a very long finish. 2009 Rasa Vineyards Living in the Limelight Petit Verdot (Columbia Valley, Washington): 90% Petit Verdot, 5% Cab Franc, and 5% Cabernet Sauvignon. Dark purple in color. Aromatic with black fruit, earth, and tar on both the nose and palate. Medium to full-bodied with lively acidity, medium to high, dry tannins, and a long finish.